We believe that beauty, sustainability, emotion, respect and innovation are the new codes of the 21st century luxury. Since 2009, the 1.618 Sustainable Luxury Movement gathers together an international network of brands, visionary entrepreneurs and creative minds who build tomorrow's Luxury and design a new lifestyle, responsible and sustainable. Supported by a committee of sustainable development experts, 1.618 Paris selects and enhances disruptive brands and services that incarnate the New Luxury. A trendsetter, a consulting firm and a creator of experiences altogether, the agency promotes pioneering companies through unique events, a digital guide & magazine and exclusive curated spaces. Our words: We have been validated and accepted into this incredible international sustainable luxury community. We are over the moon and so grateful. Being part of this community validates that our products are sustainable and that we are doing our part to make this world a better place for future generations. There is still so much to do, to achieve, to innovate yet after only 2 years running we are pretty stoked that we are on the right track. Thank you 1.618 Paris for accepting us into your beautiful and inspiring community. 9th to the 14th of April 2019. We have been invited to exhibit at Milan Design Week 2019, the most prestigious design event in the world. What an honour! We will be exhibiting our 4 collections - The FLOW, the FERN, the WHITE CLOUD and ReLEATHERED. Tables, mirrors, lights, vases, sideboard/credenza and an armoire all handmade in New Zealand. We are part of Fuorisalone, exhibiting in the Lambrate Design District which this year is joining forces with NYCxDesign from New York. It’s going to be huge! We will be exhibiting our 4 collections: The FLOW, THE FERN, THE WHITE CLOUD and RELEATHERED. Issue 153 - March 2019: Milan Design Week 2019. THE FLOW COLLECTION 2018 - Excellence in Design and Craftsmanship. We are over the moon that the Flow Collection is one of the Finalist for this prestigious New Zealand award. Brought to you by The Designers Institute of New Zealand. The Best Design Awards is an annual showcase of excellence in graphic, spatial, product, interactive and motion design along with four boutique awards. 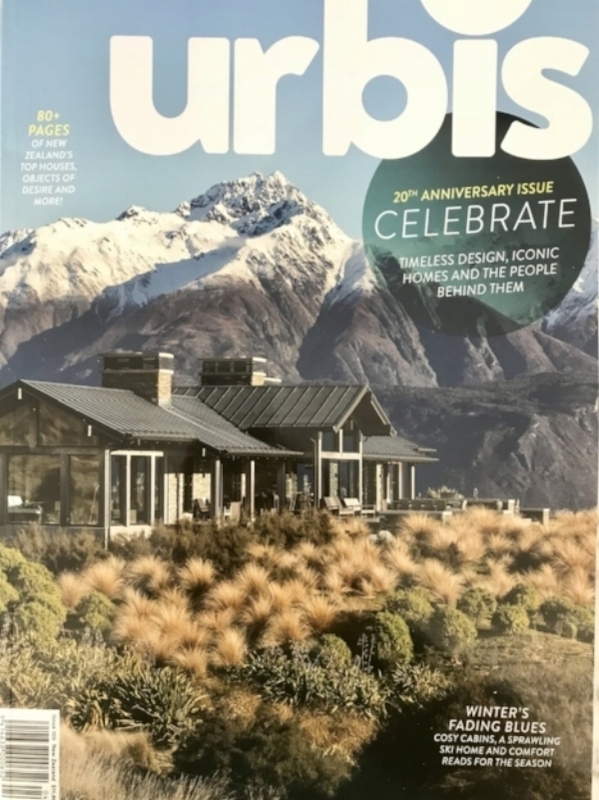 August 2018: The Flow Collection is in the latest Urbis Magazine which is celebrating 20 years of New Zealand Top Design. The Flow Collection 2018 was launched during the Design Show 2018. We spent 3 days from the 27th to the 29th of July sharing our beautiful Flow Collection, inspired by New Zealand's South Island braided river, with the public. The response was fantastic. We also showed for the first time our new lights The White Cloud, inspired by Aotearoa - The Land of The Long White Cloud. The Design Show 2018 in Auckland. 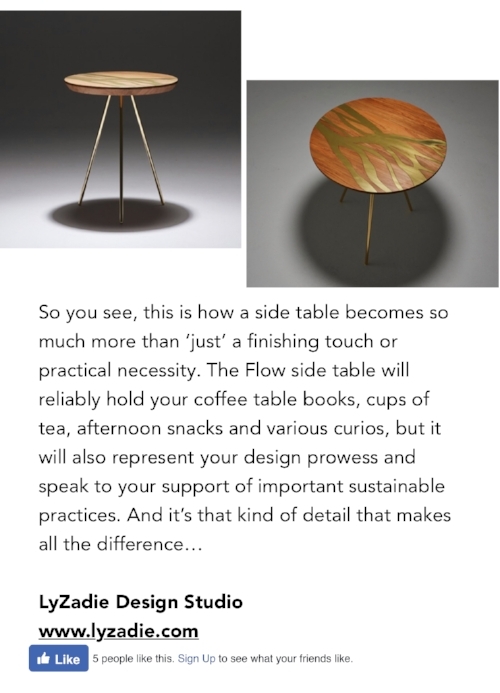 September 2018: The Flow Side Table - Father's Day gift idea. Celebrating their 5th anniversary edition. Issue 148 - September 2018: A beautiful article written about Lyzadie Renault, our creative director. Thank you Verve! Issue 49 - September 2018 - Conversation with Lyzadie Renault and Amanda Harkness. Issue 150 - November 2018: Introducing 2 new collections: The White Cloud Collection inspired by the Land of the Long White Cloud and ReLeathered Collection inspired by the story of New Zealanders. The youth suicide rate in New Zealand is the worst in the developed world. Every 63 hours a young person in New Zealand takes their own life (under 24 years old). For a population of 4.5 million in one of the most developed countries in the world this is shocking. The Lifeline Art Auction and Cocktail Party is all about raising funds and building awareness to youth suicide in New Zealand. More than that, it is a about starting a conversation and doing our bit to help. We have been overwhelmed by the support for this auction. We have more that $150,000 in art and auction items donated. It is very clear this is a powerful cause that New Zealanders both at home and around the world are very passionate about. On behalf of Lifeline and the Jake Millar Foundation, I want to extend a heartfelt thank you to the artists, our sponsors and everyone who has made this auction possible. Thank you from the bottom of our heart. This is possible only due to your generosity. From left to right: Amanda Watkins, body painted woman and Lyzadie Renault. 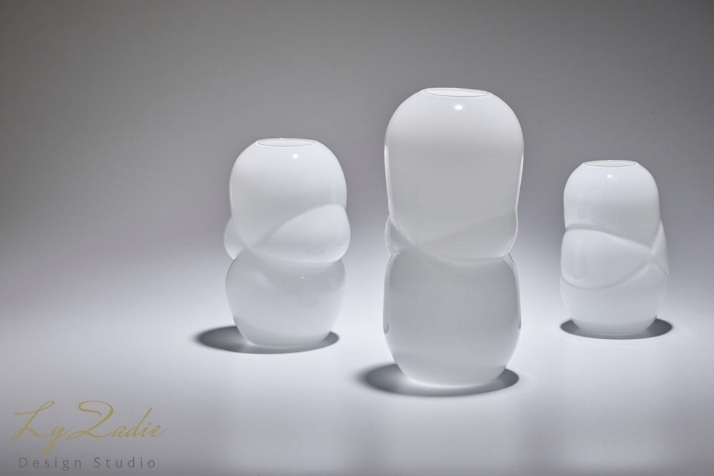 The White Cloud Vase: Donated to the Lifeline Art Auction. Hand blown glass. 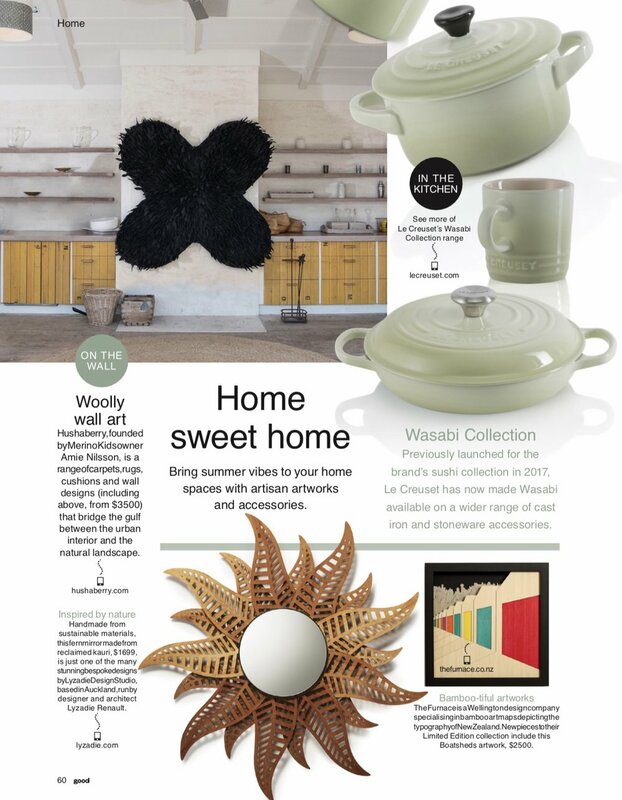 November 2018: Thank you Verve Magazine for picking 3 of our products as your pick of the month in your Home and Design section. 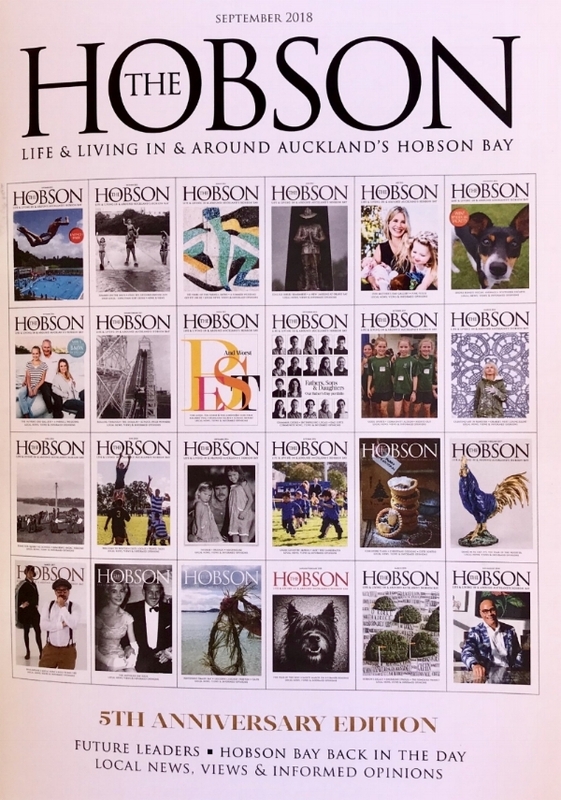 December 2018: Find us in the latest issue of the Hobson Magazine. 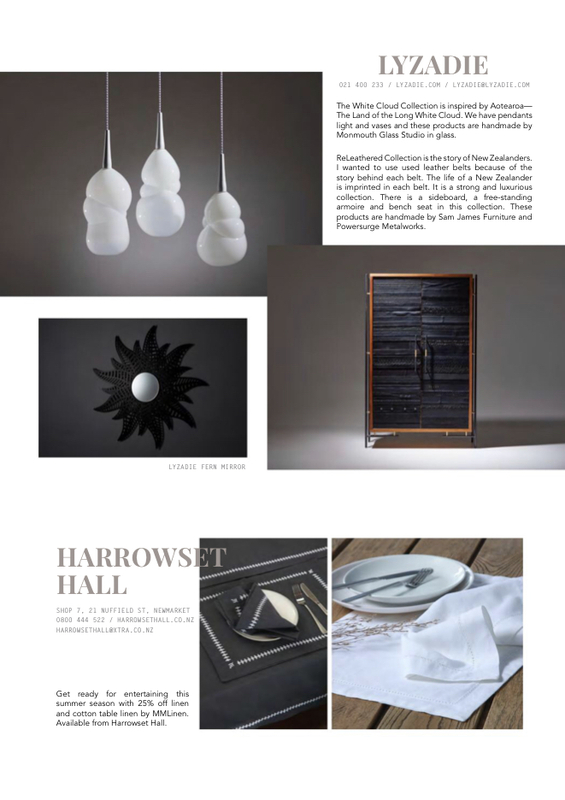 Issue 151 -December 2018: Beautiful page about our Flow Dining Table, Wood Fern Mirror and White Cloud Vases. What an amazing cover too! 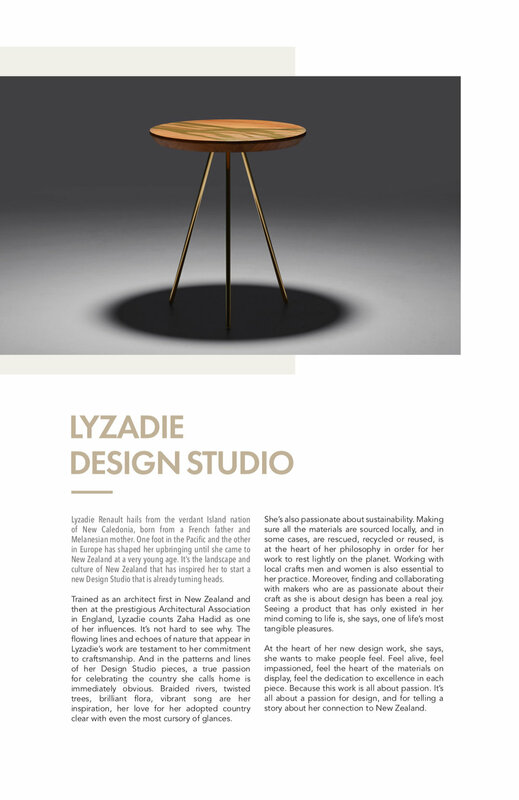 ISSUE 104 - SUMMER 2019: Beautiful article about Lyzadie in the latest issue of the QT Magazine. ISSUE 63 - SUMMER 2019: It’s an honour to be featured in this sustainable magazine. Thank you so much Good Magazine.